Board Sue Flory - Jericho Road, Inc.
Sue grew up in Vancouver, Washington in a poor and dysfunctional family which she credits for being one of the reasons she has always tended to gravitate toward social causes. Sue received her Bachelor’s Degree from Portland State as well as a Theological Education Certificate from NW House of Theological Studies. Her career experiences have included being a socio-medic at the Outside Clinic in Portland, a mentor for low-income teenagers, a houseparent at a juvenile detention facility as well as serving on the juvenile accountability board for Clark County, Washington. Becoming involved with Jericho Road was a natural continuation of her involvement. 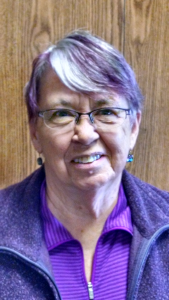 Sue and her husband Dean moved to Crooked River Ranch in 2005 where they built their home and she is a member of the ranch’s Board of Directors and both are active in the CCR Lion’s Club. They attend All People’s UCC in Redmond. Sue and Dean are accompanied on their life journey by their rescue dog, Moki.